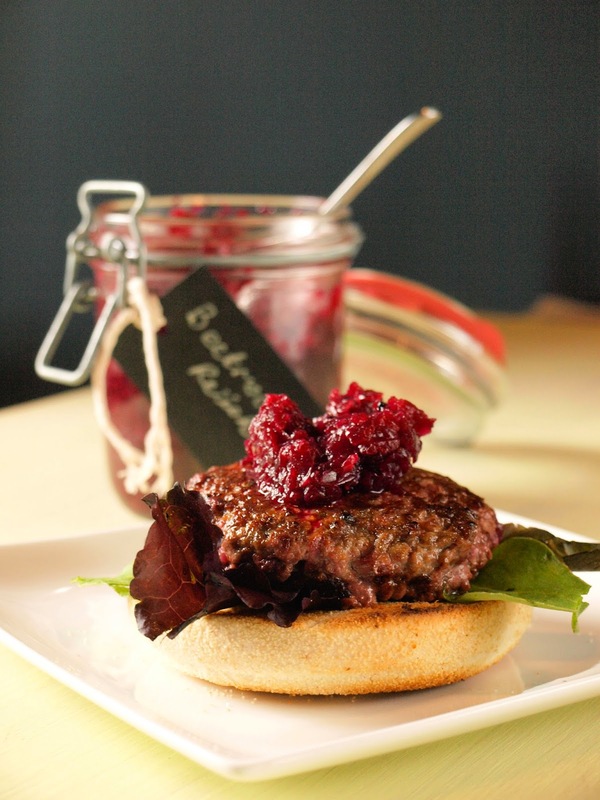 Sometimes two recipes just come together in a perfectly delicious union, and so it was with the Beetroot Relish and the Beetroot Burger. 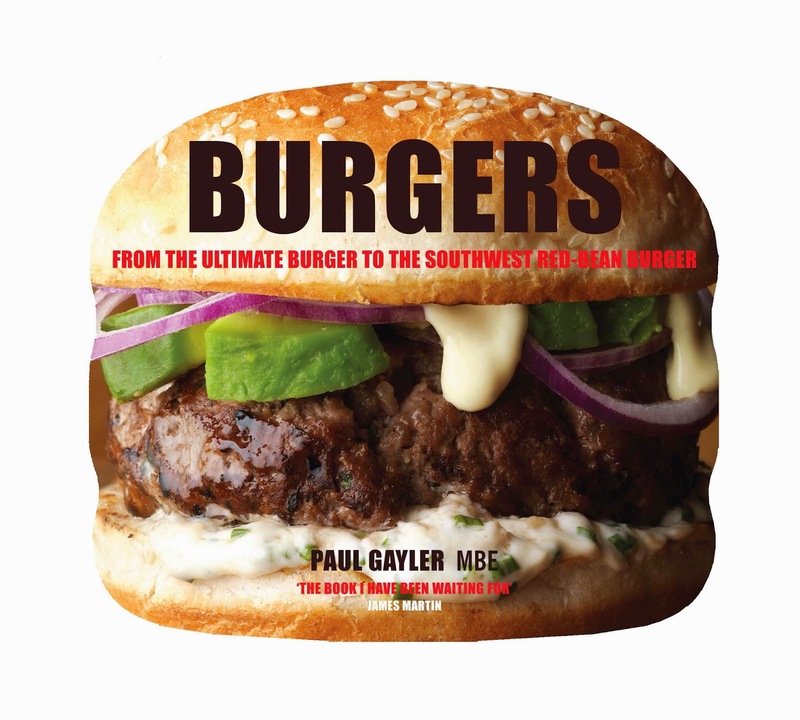 The Beetroot Burger comes from Burgers the new book from Paul Gayler MBE, hailed by James Martin as "the book I have been waiting for", which was sent to me for review. Paul Gayler was Executive Chef at The Lanesborough Hotel London, the five-star hotel on the edge of London’s Hyde Park. He has 20 years’ experience in some of the most respected kitchens and restaurants in Europe. As well as having made many appearances on British TV, he is the author of over 20 cookery books. He has also won the Guild of Food Writers’ Cookery Book of the Year and has been nominated for a prestigious André Simon Award. burger, Lebanese kibbeh burger or Jumbo prawn burger, among others. There really is a burger for everyone. There is also a section for 'Sides' including Simple Tomato Ketchup, Oven Cheese Fries, Moroccan-style Caponata and Calypso Mojo. But back to the Beetroot Burger, which is made with minced (ground) beef, the beetroot adds a glorious sweet and sour flavour, but doesn't overpower the beef at all and provides only a slight pinkish tinge, I made the smaller burgers as I felt that four burgers from this quantity of mince would make to large a portion for us. The smaller ones fit nicely on the muffin too! vegetable oil, for brushing and frying. To serve: 4 English Muffins, salad of tossed green leaves or wilted spinach, small boiled new potatoes. 2. Combine the minced beef, egg yolks, capers, sea salt and pepper. 4. Add the beetroot and juice (or relish), mix well. 5. With wet hands, shape the mixture into 4 large flat patties (the traditional shape, or 8 smaller taller patties. 6. Heat a char grill or pan grill, oil it and the patties lightly and cook them on a medium heat for about 5 minutes each side (alternately heat a little oil in a frying pan and cook them that way). 7. Split and toast the muffins, serve the burgers in the toasted muffins with a little salad of tossed green leave or with a little wilted spinach and boiled new potatoes. I added an extra spoonful of Beetroot Relish on top of the burger, just because. 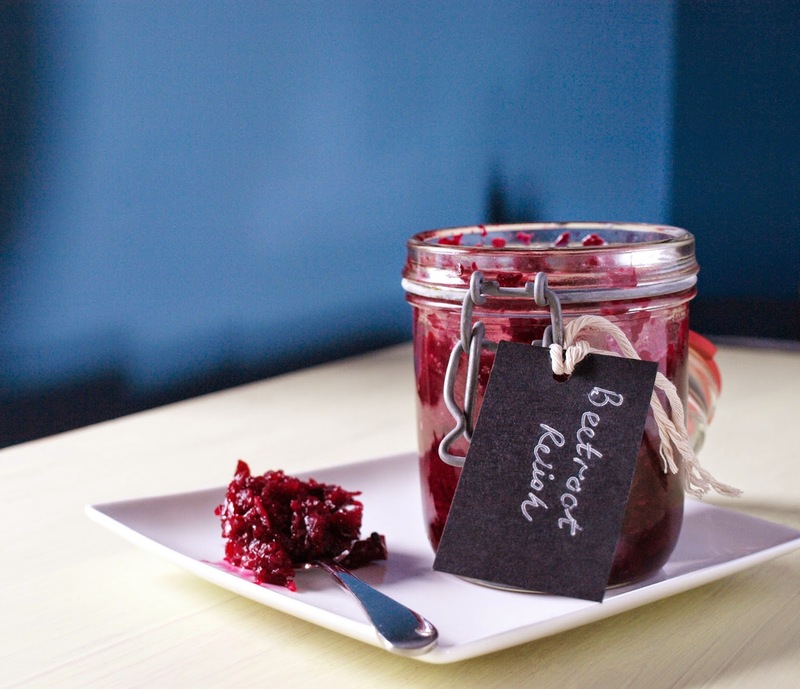 The Beetroot Relish comes via Not Quite Nigella and is made to her recipe for Lazy, Luscious, Spiced Beetroot Relish. I bought some beetroot at the Farmers Market and was planning to make the Beetroot Chutney I made last year. That particular recipe has a chunky texture which isn't very good for spreading on sandwiches, so I was looking for more of a relish with a softer texture and found this super simple recipe. I cooked my beetroot in the Slow Cooker which has to be the easiest and least messy way to bake beetroot. Simply wash the beetroot, place a piece of foil in the base of the slow cooker and put the beets on top. Bake for 5-6 hours depending on the size of the beetroot. Then, wearing a pair of rubber gloves, slip the skins off before preparing for the relish. I can't emphasise enough how good this relish is, sweet, spicy and just enough acid tang to counteract the sweetness, but no burn and no earthy taste, it's just delicious and I plan to make another batch very soon. Thanks to 'Not Quite Nigella' for allowing me to link to her recipe. 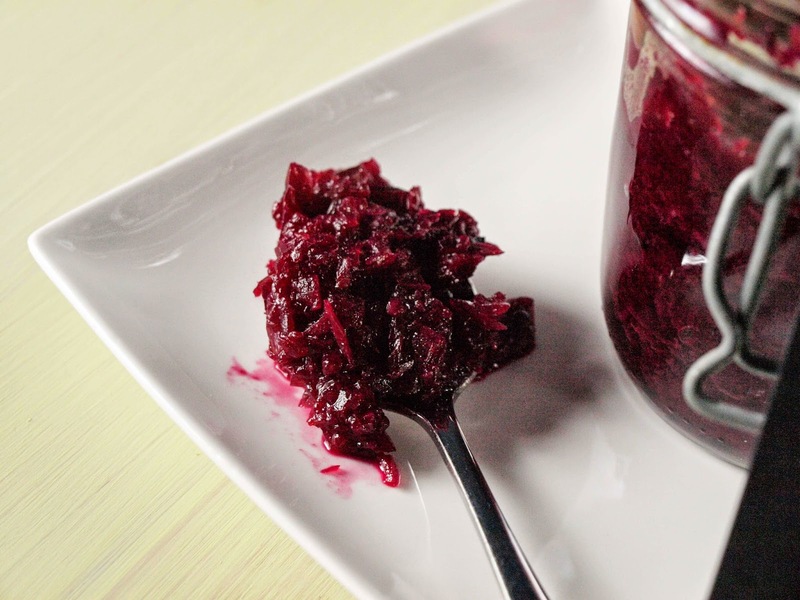 The theme for the Slow Cooker Challenge this month is preserves, as I baked the beetroot in the slow cooker, I'm including the Beetroot Relish in my own challenge event. Why not have a look and see the other entries or maybe try a slow cooker preserve recipe yourself. your photo's have improved so considerably... they look mouthwatering and those burgers look delicious but I must say it's the sauce that wins me... yes please! Oh I DO love a burger as well as beetroot Janice, so this is my dream meal! Fab relish! I love beetroot, and would be very happy with your burger and relish. Yes please! Oh that relish sounds incredible! Wish I had a slow cooker :( Burger looks fab as well. Oh I do like the look of that relish! I REALLY love the look of the relish as everyone is saying. I wonder what the shelf life is? Thanks Dom, it's hard work with the photos, but seems to be paying off. The flavour of the beetroot in the burger is quite subtle, but makes a nice moist burger. Thanks Stuart. You don't need a slow cooker to make the relish, just bake the beetroot in the oven. It seems pretty stable Fiona. I'm hoping to keep some for Christmas, but it is so good, it might not last! Not Quite Nigella might know, as it is her recipe. Thanks Jac, It is good.